System of tenure in which a father's property descends to the youngest son; ultimogeniture as opposed to primogeniture. It has been suggested that the custom arose during the pastoral or nomad period, when the eldest son would move on with his share of the flocks, while the youngest would be left behind to take up the father's position when he died. In historic times among the Jews the preference in descent went with the eldest son (see Primogeniture); but in the early legends of the Hebrews there are indications that the youngest or the younger son had the birthright. All the patriarchs appear to be youngest, sons. Jacob is the youngest son of Isaac, the younger son of Abraham, and of Rebekah, the youngest child of Bethuel, the youngest son of Nahor. The favorite wife of Jacob appears to be the younger daughter, Rachel, whose youngest son, Benjamin, is called by a name implying heirship. Joseph's youngest son, Ephraim, has the birthright, while Moses, David, and Solomon also appear to be youngest sons. 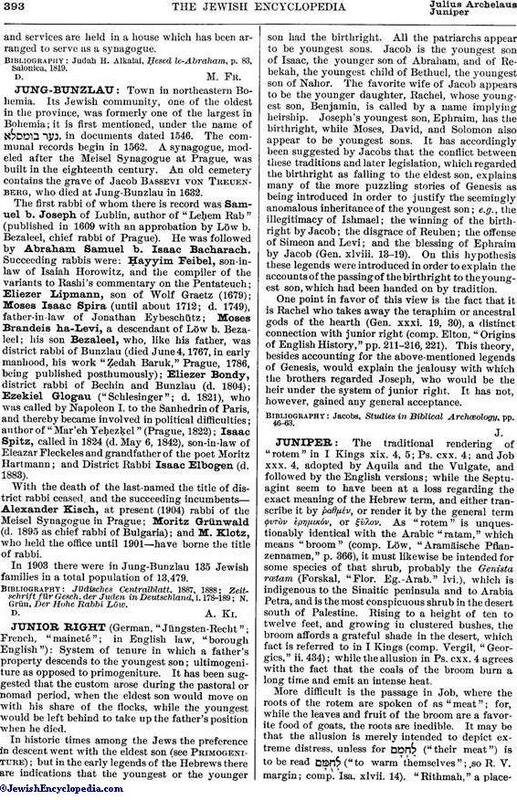 It has accordingly been suggested by Jacobs that the conflict between these traditions and later legislation, which regarded the birthright as falling to the eldest son, explains many of the more puzzling stories of Genesis as being introduced in order to justify the seemingly anomalous inheritance of the youngest son; e.g., the illegitimacy of Ishmael; the winning of the birth-right by Jacob; the disgrace of Reuben; the offense of Simeon and Levi; and the blessing of Ephraim by Jacob (Gen. xlviii. 13-19). On this hypothesis these legends were introduced in order to explain the accounts of the passing of the birthright to the youngest son, which had been handed on by tradition. One point in favor of this view is the fact that it is Rachel who takes away the teraphim or ancestral gods of the hearth (Gen. xxxi. 19, 30), a distinct connection with junior right (comp. Elton, "Origins of English History," pp. 211-216, 221). This theory, besides accounting for the above-mentioned legends of Genesis, would explain the jealousy with which the brothers regarded Joseph, who would be the heir under the system of junior right. It has not, however, gained any general acceptance. Jacobs, Studies in, Biblical Archœology, pp. 46-63.